inclined at an angle of 17.2° to the orbital plane of the true planets. This means that its orbit rises above and drops below the ecliptic plane. 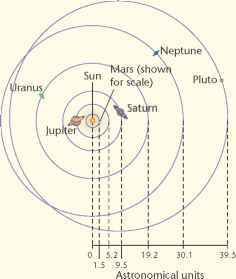 Pluto's orbit is so elliptical that for 20 years of its orbital period it is closer to the Sun than is Neptune, which follows a near-circular orbit. Like Uranus, Pluto is also tipped over on its side. Its rotational axis is inclined at an angle of 122.5° to the plane of its orbit. This means that Pluto's equator is almost at right angles to the plane of its orbit. Pluto also rotates in the opposite direction to most of the other planets, with one rotation taking 6 days, 9 hours and 18 minutes. 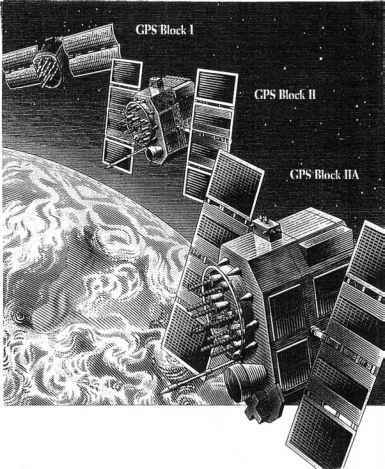 Figure 13.4 Orbital path of Pluto. Notice how different this is from the paths of the major planets. At its closest approach to the Sun, Pluto is 30 times more distant from the Sun than is Earth. At its greatest distance from the Sun, Pluto is 50 times more distant from the Sun than is Earth. Pluto will next be at its maximum distance from the Sun during the year 2113. During the coldest 124 years of its orbit, all of Pluto's atmosphere condenses and falls to the surface as frost. Images taken of Pluto by the Hubble Space Telescope have shown that the reflectivity of its surface varies. Lighter areas are probably patches of nitrogen and methane frost as well as exposed regions of water ice. The high average density of Pluto (2.03 g/cm3) indicates its composition is a mixture of about 70 per cent rock and 30 per cent water ice, much like Triton. One theory is that Pluto and Triton formed at the same time in the same part of the solar nebula.